Daniel Beilschmidt, Atef Botros, Aiman Mubarak, Anwar Al-Ghassani, Lisa Franke ,Walid Abd El Gawad, Nadine Adam. 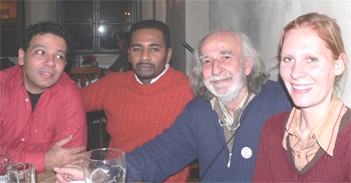 Atef Botros, Aiman Mubarak, Anwar Al-Ghassani, Lisa Franke. 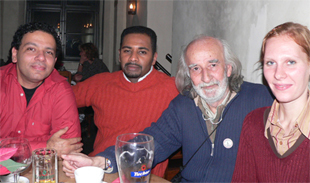 Atef Botros, Aiman Mubarak, Anwar Al-Ghassani, Lisa Franke. 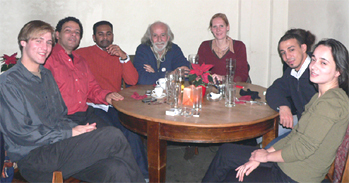 Atef Botros, Aiman Mubarak, Anwar Al-Ghassani, Lisa Franke, Mischa. 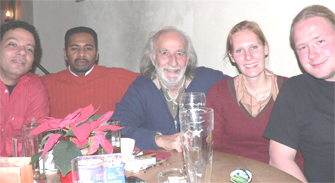 Aiman Mubarak, Anwar Al-Ghassani, Lisa Franke, Mischa. Lisa Franke, Mischa, a friend, Walid Abd El Gawad. 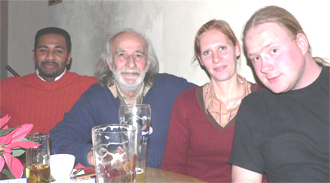 Walid Abd El Gawad, Nadine Adam, Daniel Beilschmidt. 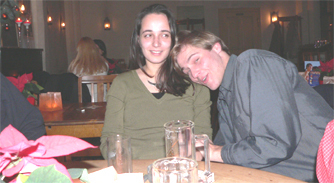 Nadine Adam and Daniel Beilschmidt. A friend. 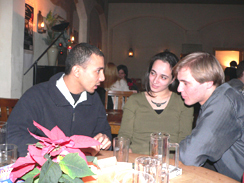 Recital at Orientalisches Institut of the Universität Leipzig, Wed., Dec. 7, 2005, 19:00, organized by the Association of Arab Students and Academics. For the first time I read poems in all my four languages: Arabic, English, German and Spanish. 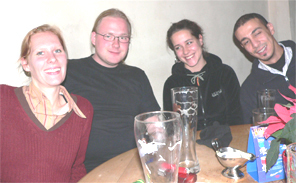 After the recital we went to Kultur Café Alte Nikolai Schule opposite to Nikolaikirche. Click on the orange name to see photos and info about this historic site. Click on "Comments" at any section and send your opinion. I love to hear from you and would send you a reply.